LEE COUNTY, Fla. -- Straws, plastic bags... there’s been some big pushes to get rid of plastic in Southwest Florida; not only by business owners but lawmakers, too. Now there’s another proposed bill - House Bill 603. 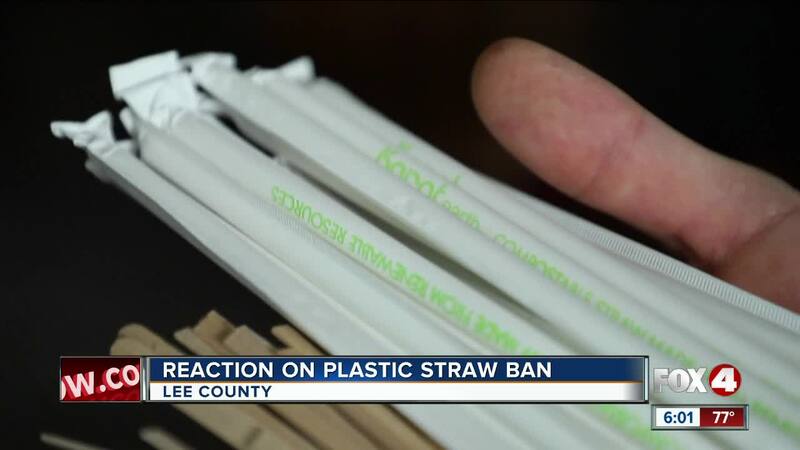 Republican Lake County Rep. Anthony Sabatini, who introduced the bill, writes, “a municipality, county, or other local governmental entity may not adopt, enforce, or implement any ordinance, rule or law that would further restrict a food service establishment from distributing single-use plastic straws to a customer." Doc Ford's, a restaurant near Fort Myers Beach, adopted the plastic straw ban last year when Fort Myers Beach leaders banned them from businesses. The family-owned restaurant didn’t need to adopt the ban because they’re actually not on Fort Myers Beach, but managers felt it was necessary. But other people don’t agree with House Bill 603. Including Sanibel Sea School Executive Director, Bruce Neil. He was a part of the process to ban plastic straws in Sanibel. “I think some level of governmental regulation is needed to get citizens to act for the betterment of the community,” Neil. Plus environmentalists like Tricia Fancher with Keep Lee County Beautiful doesn’t see any ban as an end all be all. “I do hope that people understand that straws are one very tiny piece of the problem, single-use plastics overall are the problem,” Fancher said. If any bill on the table pertaining to straw bans is voted into law, it will become effective July 1st.